From 1830 to 1880, Jacques-Simon devoted his time and inventiveness to fancy needlework, starting la Maison Sajou in 1830. His goal: to sell supplies for all types of the Needlearts. With the creation of his pattern albums, he reached intense fame in France and all of Europe... his original albums are very valuable and intensely sought-after collectables today! The trade name 'Sajou' fell into oblivion some years later, presumably after Jacques passed. It had not been used since 1954, and therefore, under French law, became available in 2004 for a new owner! Frederique Crestin-Billet is the new owner of Sajou, and promises to present the vintage designs and articles as they were -- without edits. Relying on the excellent name of Sajou, she is producing product using modern production methods, while maintaining a world that reminds us of the haberdasheries of yesteryear. I love her things... and hope you will, too! 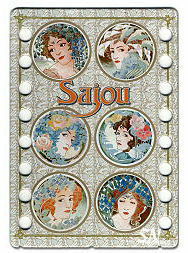 Exquisite chipboard palettes from Sajou of Paris, France! Sturdy 4 x 6 boards featuring 18 pierced holes to store your lengths of threads for any special project. Lovely and sophisticated, each side is different, and offers breathtaking artwork to be tucked into a sewing case, antique needlework shadowbox display... displayed beside an antique sampler... start dreaming! Each palette is different on each side. Many of these coordinate with Sajou's Thread Winders to make a really neat set of *smalls. * So, so cool, these are made from the same board as the little thread winders, and are another treat for a stitcher! USE them... they're too pretty to tuck into a drawer and lose! The 6-needle Tapestry set includes 18, 20 and 22 needles -- it is in the pink and green sleeve. The 'Broder' set features 15 Embroidery needles ranging in size from 3 to 9. The Sewing Needle Set -- Coudre, in the blue sleeve -- has 15 asst needles, sized 3 to 9 also. Needles, needles, needles... they come in a million sizes and every one is a bit different and perfect for just it's task! The Tapestries are great for needlepoint and cross stitch on larger fabrics with perle cottons (like the Shepherd's Bush stockings.) The Embroidery needles have a sharp tip but a larger eye for more threads... while the Sewing needles are slimmer, still sharp, but have a much smaller eye.